Berlin Tempelhof Airport was one of the spots that we wanted to visit in Berlin. The airport was built in the 1920’s and had been an iconic airport for decades, e.g., by the famous Berlin Airlift which with the allied forces supplied West Berlin once surface traffic was blocked by the Soviet Union in 1948. In 1909, Frenchman Armand Zipfel made the first flight demonstration in Tempelhof, followed by Orville Wright later that same year. Tempelhof was first officially designated as an airport on 8 October 1923. Deutsche Luft Hansa was founded in Tempelhof on 6 January 1926. […] described by British architect Sir Norman Foster as “the mother of all airports”. The airport closed operations in 2008. The coincidence was that the Berlin marathon fair was organized at Tempelhof thus we didn’t need to schedule the visit since we would go there to pick the running bibs. See below some pictures from the airport. Is a hassle-free airport possible? Some years ago on trip to India, I remember having passed through the security check just before getting into the airplane at Schiphol airport in Amsterdam. However in the subsequent flights I have taken from there I never saw this again… until last summer, on another trip to a non-Schengen destination, Tunisia. Here is the picture I took. 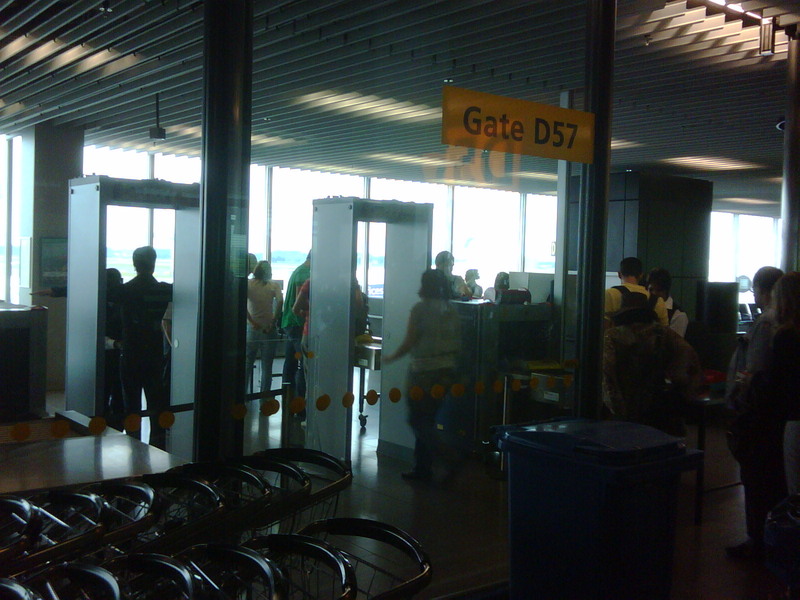 X-ray scanners and metal detectors at Schiphol, Amsterdam. As you can see, in terminal 1 departures D of Schiphol airport, the security control is located just where each boarding gate is. It may have around 230 boarding gates among all the terminals (over 60 between T1, T2 and T3, around 90 in T4 and over 60 in T4S).